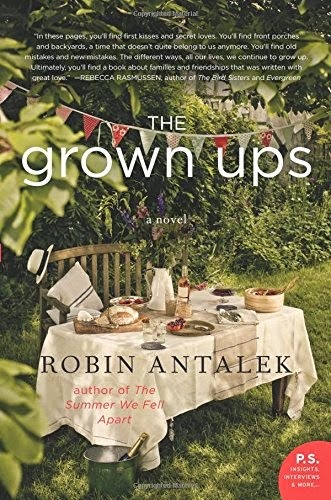 What They Say....From the author of The Summer We Fell Apart, an evocative and emotionally resonant coming-of-age novel involving three friends that explores what it means to be happy, what it means to grow up, and how difficult it is to do both together. What I Say....It took me a week to read this book. Not because of the book, but because I started a new job and was so overwhelmed and exhausted that I kept falling asleep at night with the book in hand. This was a coming of age book, which I always enjoy, and it was a good one. We follow the lives of Sam, Suzie, and Bella from the times they are teens up through middle age. Since I grew up in a small town, people staying in the lives of their friends and neighbors through their whole life didn't seem strange to me. I really liked how the story was told in alternating voices. I'm definitely going to find the author's previous book, The Summer We Fell Apart. I do have to say towards the end, I was holding my breath because I kept thinking that there was going to be a car accident or some type of horrible death, but thankfully, there wasn't. There's enough happiness and heartbreak in everyday life, and this book illustrated that perfectly. Thank you to Booksparks for the review copy!